Cool rice completely. Set a medium skillet over medium heat. Add 1 tablespoon olive oil. Add garlic and let cook 30 seconds. Add asparagus spears and cook stirring occasionally until cooked but still crisp, about 4 minutes. Season with a little salt and pepper and set aside. 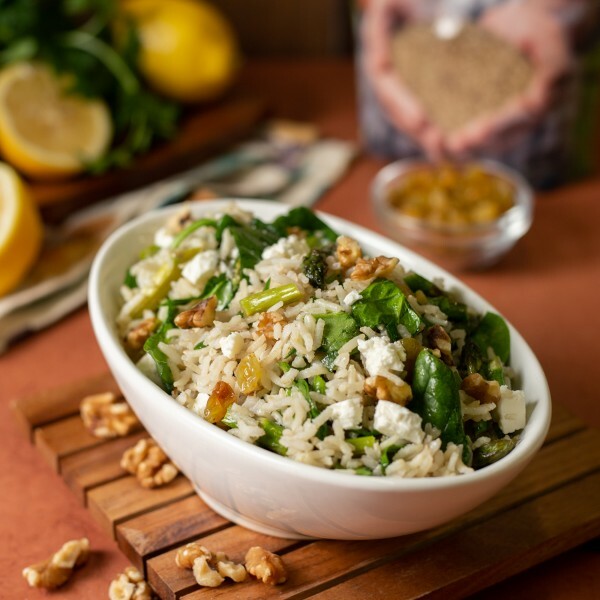 In a large bowl add cooled rice, baby spinach, asparagus, plumped raisins, and walnuts. In another small bowl mix together honey, lemon juice, and 2 tablespoons olive oil. Season with salt and pepper. Add the dressing to the rice mixture and gently toss. Add feta cheese and gently toss again.